When most people recycle, they put their plastics in a recycling bin and call it a day. But for students and faculty at the International School of Beijing (ISB), recycling means more than this simple act. 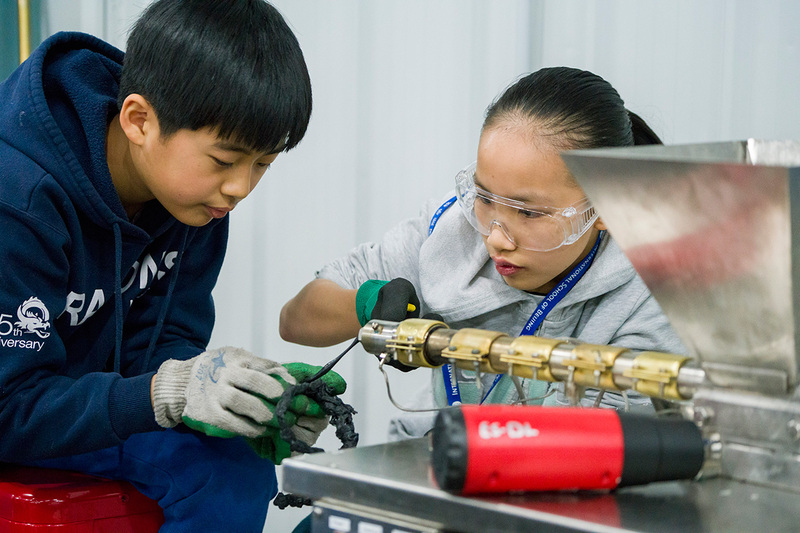 The school's Fabrication Lab is now home to its own recycling facilities where students, teachers, and members of the community can convert their plastics into reusable products of their choice. With growing awareness around the world about the negative impact of plastic pollution, ISB wants its students to help shape solutions to this pressing problem. "We would like students to be considerate of the materials they choose to use when they create, but also design solutions to positively impact our community and the world," says Julie Lemley, the middle school and high school design technology facilitator in charge of bringing the facilities to the school. "I thought it would be a great new layer for our design program, a new way to encourage more sustainable design." 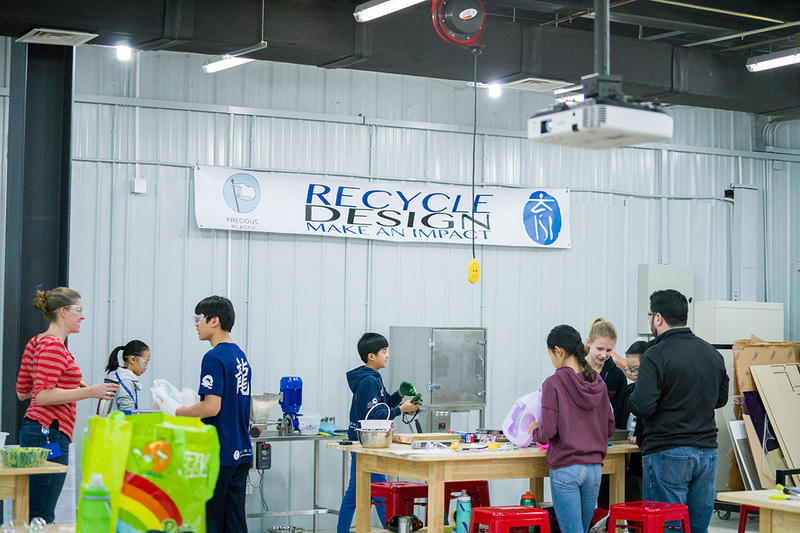 As part of this design program, students have the chance to see the recycling process first-hand and can choose how they want to reuse their plastic products, developing creative problem-solving skills and expanding their understanding of global impact. In her ongoing quest to grow and evolve the design program, Lemley discovered Precious Plastic—a global project trying to boost plastic recycling worldwide. Beginning in 2013 by Dave Hakkens in the Netherlands, Precious Plastic aims to provide tools and knowledge to communities around the world in an attempt to provide people with the solutions to fight plastic pollution. Lemley applied for funding and was able to invite a Precious Plastic expert to ISB to help set up the machines and train students and teachers to use them. "The message of Precious Plastic is to show people that plastic is something precious, not a throwaway material," says Mathijs Stroober, the Precious Plastic expert who visited ISB from the Netherlands. As China made the decision to ban plastic imports earlier this year, ISB also hopes its students will develop an environmental consciousness through exposure to initiatives such as Precious Plastic, and carry this consciousness throughout their lives. "Kids have a more open mindset—they are the future," says Stroober. "If kids get more conscious of sustainability, they can slowly change the current vision of plastic usage." This change is needed more than ever in light of a spate of reports about the harmful and pervasive impact of plastic, igniting a global movement to cut back on its use. A recent investigation by Orb Media tested water samples from various nations, finding 83 per cent of the samples to be contaminated by plastic particles. These microplastics absorb toxins, which are released into the human body when ingested. "Plastic use and disposal are huge concerns worldwide," says Lemley. "Our students will be leaders of companies, organizations, maybe even countries in the future. We want them to have a good understanding about the impact of plastics on our environment and the different ways to reduce and think about sustainable design when creating new products." The plastic recycling centre at ISB is open to all students, teachers, and the larger community. Teachers can incorporate its use into classes, units, and curriculum, while environmental clubs and community groups can use it year-round. 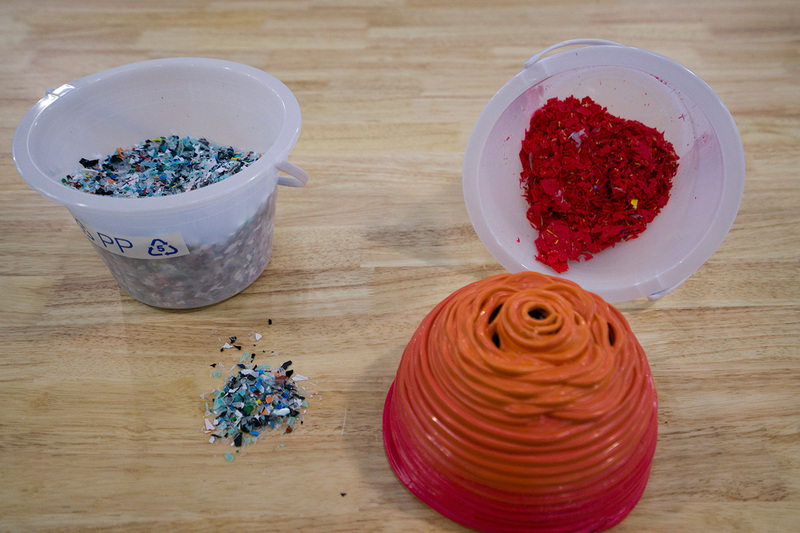 Teachers connect with design facilitators and work with the students through the process of recycling, including cleaning and sorting the plastic, and designing the product. Only trained teachers and faculty operate the machines. Although it is currently used by the middle school and high school divisions, the centre has garnered interest amongst elementary school teachers and students as well. In particular, the Roots and Shoots club is looking to help with the collection and sorting of the plastics. "The students were very excited to meet with Mathijs and learn more about how we can recycle plastics at ISB," says Lemley. "They've learned a lot about different types of plastics and what we can make with our Precious Plastic machines." "I enjoyed seeing the amazement of the kids," adds Stroober, who hadn't worked with younger students before. "Some asked if the samples really were made out of plastic and if we used paint or other materials too, which we don't. Spreading the enthusiasm to the staff was really nice. 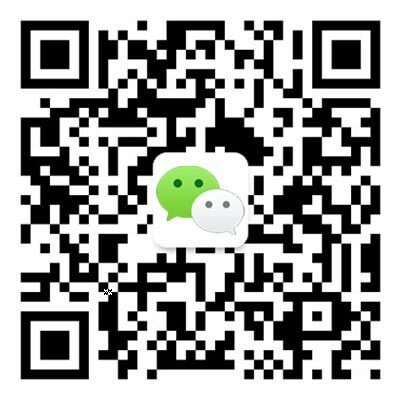 I hope to see some products and samples from ISB soon." The variety of products to be created is far-reaching from colorful art pieces and practical home décor objects to construction materials and jewelry. High precision materials, such as smartphone cases, can also be made. The organization of the recycling centre at ISB is ongoing, as the school works to develop the many facets into a coherent plastic recycling program. This will eventually involve student and community groups working to help collect and sort the plastic, and help develop systems to educate the community on the potential of plastic recycling. Lemley would also like to foster an entrepreneurial spirit within students, encouraging them to create and design their own products to be sold at fundraising initiatives. "While we can't recycle all types of plastics," says Lemley. "Having this system has made us think more about our plastic use, and how we can reuse and recycle plastics into other beautiful, useful products." To find out more about Design at ISB, click here.